Hotel Dolce Sitges gathers the essential elements to satisfy all your needs. Its location, in the picturesque village of Sitges, just 25 minutes from the Barcelona-El Prat International Airport and 35 minutes from Barcelona on a quiet hill with stunning views of the sea, is one of its most valued features by the guests. 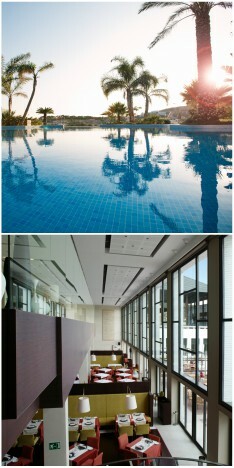 It has 263 elegant rooms and suites with natural light that enter through its large private terraces. The hotel is integrated into the surroundings of the Garraf Natural Park, offering spectacular views either to the sea, its pool area or the golf course. Among the services included is the high-speed Wi-Fi connection and access to the hotel’s wellness center, Dolce Vital Spa. Business travelers are fortunate with Dolce Sitges hotel, as it is perfectly equipped for all kind of meetings. It offers 2,175 m² divided into 2 plenary rooms with a maximum theater capacity for 360 and 475 people, 9 meeting rooms, 13 sub-commission rooms, 2 assembly rooms, 13 rooms convertible into meeting rooms, a multifunctional room and a conference room and / or private dining room. All these spaces offer ergonomic furniture, natural light and the latest technology in audiovisuals, as well as a nourishment hub or coffee break continued for groups. The hotel is also an excellent option for gastronomy lovers, since its variety of restaurants and bars presents a wide range of tastes, flavors and smells of Mediterranean and international cuisine.